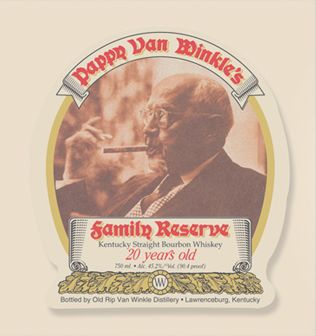 If you’ve been paying attention to the news at all, you’ve heard about The Great Pappy Heist, in which 65 cases of 20-year-old Pappy Van Winkle bourbon and nine cases of 13-year-old Van Winkle rye with a combined value of more than $26,000 were stolen from Buffalo Trace Distillery in Frankfort, Ky. The caper, which authorities suspect was an inside job, has made the already rare Pappy Van Winkle even more so. Only about 7,000 cases per year are released from by Buffalo Trace, and many retail outlets have long waiting lists for their allotment. The sketchy details of the case so far – the bourbon was taken from a locked area in a warehouse at the distillery! Someone subsequently tried to sell a large amount of Pappy to a liquor store in a nearby county! It was a high school principal! No, wait, he was trying to buy Pappy, not sell it – have led some to theorize that it’s all a big publicity stunt. Except that Pappy Van Winkle is the last bourbon in the world that needs any more publicity. And so we must take solace in other spirits. But wait – what’s that? Now comes word that the world is teetering on the edge of a global wine shortage. A study released Monday by Morgan Stanley Research says last year saw the largest shortfall of wine – about 300 million cases – in almost 50 years, and predicts that the situation will only worsen as more people drink wine and production in the three largest wine-producing countries (France, Spain and Italy) lags. Oh, the humanity! There is a sliver of good news, however; 2013 has been a stronger year for wine production than any of the past five. You know what to do: Get out there and hoard that vino! But make sure you save your receipts.